Learn to Hypnotize Anyone from the Comfort of Your Own Home in This Video Home Study Certification Training ... It's 100% Guaranteed! 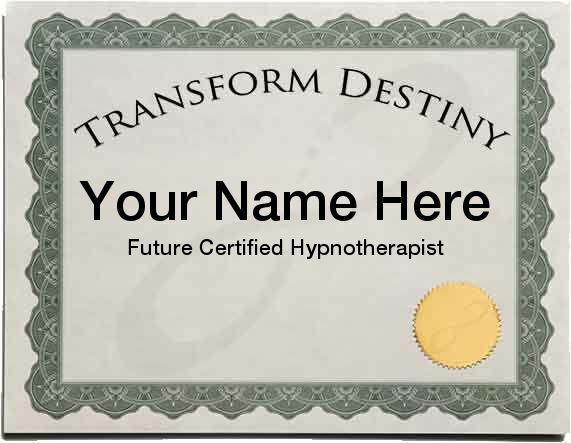 Earn your certificate in Clinical Hypnotherapy with full scripts and step-by-step strategies for weight-loss, smoking cessation, pain control and more in just three to five days in this fun, home-study video training from Transform Destiny. "Eighteen years ago, I was trapped in a corporate job I hated until hypnosis came into my life. Becoming a Certified Clinical Hypnotherapist was the best thing I ever did. And now you can learn from home!" Enroll now for Massive Savings!! Now you can learn to hypnotize people in this online hypnosis certification course taught by world renowned Master Hypnosis Trainer, Michael Stevenson, author of the book Learn Hypnosis... Now! (included as a bonus). You'll be hypnotizing your first subject at home within just a few hours – it's guaranteed! In this video training, you'll learn an incredible, foolproof, eight-step method for hypnosis that will have everyone you know saying, "Hypnotize Me!!!" You can even make an impressive income working from your own home or office with the fully-qualified certificate in Clinical Hypnotherapy you'll earn in this course. No prior experience is necessary, and no degrees are required. "The Learn Hypnosis training proved to be extremely valuable and lot of fun as well! Since taking this training, I have already worked with athletes and actors to help them attain their goals and desires. Thank you for transforming my destiny!! " "Just saw my first hypnosis client! The Learn Hypnosis course is already half paid for, and one more nonsmoker joins the ranks. Have 2 more clients booked and 3 more prospects. Thank you!" "Michael is a great guy and a fantastic trainer. I now recommend all my friends and clients to him exclusively." "The material that was presented at the seminar was easy to understand, thorough and concise. When you leave the seminar you know that you have the ability to utilize the skills professionally and with confidence." Tools and Interventions: Learn to work with weight loss, smoking and pain control and more. In this online, work-at-your-own-pace home study course, you'll learn everything you need to know to use hypnosis for weight-loss, smoking, pain control and more! You'll watch Michael teach the full course on your tablet, smart phone or computer from the comfort of your own home with our online videos that play right from your web browser. The video is a recording of the entire live hypnosis course that Michael has taught for years in California. It's just like being in the classroom, watching him instruct and it's just as easy as watching Netflix, Hulu or iTunes. And if you ever have questions, you can call, text, email or live chat us and we will answer any questions you have about the course and materials. You'll learn exactly what hypnosis is and how to hypnotize people using this amazing, fool-proof, eight-step method for hypnosis. Knowing these techniques will allow you to literally hypnotize anyone, anywhere and to be qualified to work with others professionally for pay — It's guaranteed! 4. Record a video of yourself doing the method from start to finish using your mobile phone, tablet, camera or video camera and send it in. 5. Your video will be evaluated by a Certified Trainer of Hypnotherapy. When you pass, you'll get your certificate of completion in the course. Our training is approved by the International Board of Coaches and Practitioners, so you will be qualified for Board Certification as a Clinical Hypnotherapist without any further testing. Joining the board to become a Certified Clinical Hypnotherapist is easy and costs just $9.99 /mo for your board membership. Learn in your pajamas if you want — it's your home! Earn your certification and start seeing clients for pay right away! If, for any reason, you find you are not completely happy with the training, or feel that you are not learning hypnosis easily and effortlessly within 30 days (which is plenty of time to watch it), simply call us, live chat us from the website, or send us an email for a full, complete and friendly refund. With our convenient payment plan, you could be seeing your first clients and receiving your first checks before the final payment is due. Just click the Add to Cart Button below and choose the payment plan at checkout. No credit checks, no hassles, no worries. You'll still get immediate access to the training. "Wait... Why Is it Only $147??" What we do know is that the event will 100% happen (people are already signed up, so we're committed), it will be in St. Louis, MO, and it will be April 27 - 29 from 10:00 AM to 7:00 PM each day. If that's enough info for you to sign up now, then you will enjoy a steep discount while we get that all worked out. Enroll in Learn Hypnosis... At Home! Join The "Early Advantage" Waiting List We'll Email You With a Discount When Tickets Are Available! Michael is the author of the best-selling book, Learn Hypnosis... Now! and has been teaching people hypnosis and hypnotherapy for over 17 years.